I am filled with gratitude for all the participants and faculty whose love for this work on psyche, matter and soul opened our hearts and minds to unimaginable vistas during these past 30 years. While many of these pioneers are no longer with us, their legacy lives on in our work and in the generosity of spirit that fills the Assisi community. This year’s conference theme, The Time of the Forgotten and The Life Needing to be Lived, is ever-present in the fields of literature, psychology, spirituality and the new sciences. In Elie Wiesel’s novel, The Forgotten, where, because of a father’s “diseased memory, his son is asked to remember for him. Throughout his life and work Elie Wiesel speaks of this need to remember because to forget, he reminds us, creates conditions for the re-occurrence of events we pray will never happen again. In the biological domain, Sheldrake’s work on the “Presence of the Past” speaks to the role of memory (archetypal) in the formation of biological form. So too, in virtually every spiritual practice, there is a reverence for the past. From Christianity’s “anamnesis,” Judaism’s, “The Day of Remembrance,” and Eastern religion’s, “Akashic field,” we find a spiritual imperative to remember. In psychology, Freud stressed the need to make conscious our "forgotten memories," otherwise we tend to "repeat what we do not remember," while for Jung, it was the reality of an inherited, archetypal memory and the presence of an “antique Soul” that is central to his work. All of these traditions pay homage to the living presence of Mnemosyne and Lethe, the deities of Memory and Forgetfulness. Memory is not so much about events as it is about Eros. It reminds us of our relationships to Self and others. So too, this memory of the past shapes present, and future life. Dr. Yoram Kaufmann believed that those most enduring childhood memories reveal the mythic, archetypal nature that will unfold, and become our future. Our inability to find a place for those troubling memories keeps us shackled to a constrained, Sisyphean world whereby our movement into the future is thwarted by these "forgotten" memories which keep pushing us back down the hill. While retrieving these memories is a psychological issue, learning to live with what we remember, is a spiritual process. In reflecting on the past, we look to the present as an intimation of our future. Rabbi Heschel speaks of “time as sacred”, and how in preparing for the Sabbath, one enters this sacred time, which; “…comes like a caress, wiping away fear, sorrow, and somber memories”. His joy in preparing his heart, soul, and home for the coming of the Shekinah- the Queen, also speaks of a future calling to be lived. Ultimately, we have to agree with the sages and dreamers, who understood that all time is about essence, expressing an eternal, archetypal reality. With a faculty of leading Jungian analysts, mythologists and authors, we will address this weaving of past, present, and future into this eternal moment, and look at ways to prepare our own psychic home for the arrival of these new creative possibilities. In addition to faculty presentations, there will be special presentations given by our international students and graduates on the role of archetypes and archetypal patterns in their respective countries. We truly hope that you will join us for this historic event in the village of Assisi, Italy. Here, you may feel the sacredness of time and place and understand why St. Clair and St. Francis knew that Assisi was truly their home, for in this sacred space, the veil separating the material from spiritual reality lifts, allowing us to experience something of the transcendent. During the conference, we will feast on delicious regional foods and wines, including wines such as Sagrantino di Montefalco and from the vineyards of La Cantina Lungarotti which is just a short drive from Assisi. Perhaps the best known foods of this region are; Pasta con Tartufo (Pasta with truffles) Raviolis, wild game, including cinghiale (wild boar), and the freshest of vegetables and cheeses, and the most delicious Burrata cheese in the world!!!! 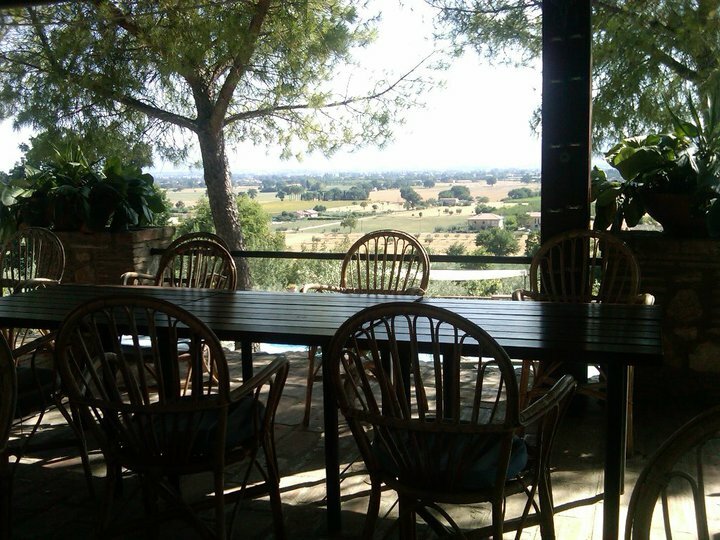 Lunch and dinners will be taken at our conference site, The Country House-Tree Esse, where we will dine al fresco, on the patio overlooking the splendor of the Umbrian valley. So please join us for this unique and profound confluence of matter-spirit and soul this summer in Assisi, Italy. ​​JOAN CHODOROW, Ph.D., is a semi-retired Jungian analyst practicing in California's Bay Area. 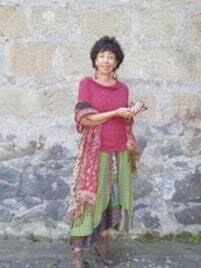 She is a graduate of the C. G. Jung Institute of Los Angeles and a member of the C. G. Jung Institute of San Francisco. Her early background includes dance studies, performing and teaching. Dr. Chodorow participated in dance therapy training with Trudi Schoop and Mary Whitehouse. She is a Board Certified Dance/Movement Therapist (BC-DMT) and former president of the American Dance Therapy Association. Dr. Chodorow is the author of Dance Therapy and Depth Psychology (1991), and the editor of Jung on Active Imagination (1997).She lectures and teaches internationally. MICHAEL CONFORTI, Ph.D. is a pioneer in the field of matter-psyche studies. Dr. Conforti is actively investigating the workings of archetypal fields and the relationship between Jungian psychology and the New Sciences. He is a Jungian analyst and the Founder and Director of The Assisi Institute. 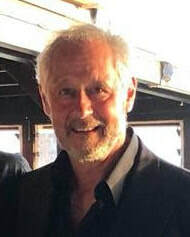 Dr. Conforti is the author of Threshold Experiences: The Archetype of Beginnings (2007) and Field, Form and Fate: Patterns in Mind, Nature and Psyche(2002). His books have been translated into Italian and Russian and a Spanish edition is now in preparation. Arlene Diane Landau, Ph.D., is a Diplomate Senior Jungian Analyst and is a member of the C. G. Jung Institute of Los Angeles, the Inter-Regional Society of Jungian Analysts, and the International Association for Analytical Psychology. Dr. Landau has been a certified Jungian analyst for 25 years. She holds a bachelor’s degree in fine art, master’s degrees in psychology and mythological studies, and a Ph.D. in mythological studies, and has lectured internationally. She is in private practice in Pacific Palisades, California. Elena Liotta was born in Buenos Aires, Argentina, now living in Orvieto, Italy. She is a clinical psychologist who specialized as a Jungian psychoanalyst and Training Analyst. She also has an international background and university degree in Oriental Studies (Roma, La Sapienza). 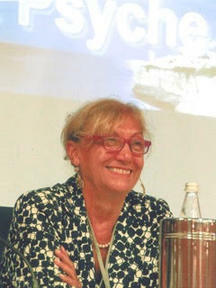 In addition to her clinical practice she has served as a city councilor in the local government of Orvieto, focusing on Health, Education, Social Services and Youth. She has supervised women’s help organizations and was a Professor of Continuing Education which included gender issues. Elena continues to work as a consultant on refugees, migrants, women soldiers on UN missions, preventing abuse, and she continues to participate in international multicultural projects and encounters. Among her publications are books and numerous articles including: On Soul and Earth. The Psychic Value of Place, Routledge, London New York 2009; Gender and Power, Towards Equality and Democratic Governance (chapter 18) Palgrave Macmillan 2015; A modo mi: Donne tra creatività e potere, Edizioni Magi, Roma 2007. DENNIS PATRICK SLATTERY, Ph.D. is an author, poet and educator. He is a core faculty member at Pacifica Graduate Institute, where he was involved in the development of the Mythological Studies program. His areas of emphasis include the poetic imagination, writing and reading as mythic activities, the relation of psyche, spirit and matter, and the place of contemplation within the academic setting. He is the author of more than 25 books, and perhaps is best known his book, The Wounded Body, which was included in The Best Books for Academic Libraries in 2002. Caterina is a Jungian analyst in private practice in Milan. She trained as a psychologist at the University of Padua and at the Jung Institute in Zurich, and is a training analyst there and at the Centro Italiano di Psicologia Analitica (CIPA). She has served as Director of Studies, Honorary Secretary and Treasurer of CIPA’s Milan Institute, as well as its National Treasurer and Vice President. She has done extensive research on children’s dreams, child analysis, the psychology and physiology of sleeping and dreaming, the associations experiment, and has written extensively on these topics. View from the Tres Esse Front Terrace looking out over Assisi countryside. view from the Tres Esse terrace where meals are served. 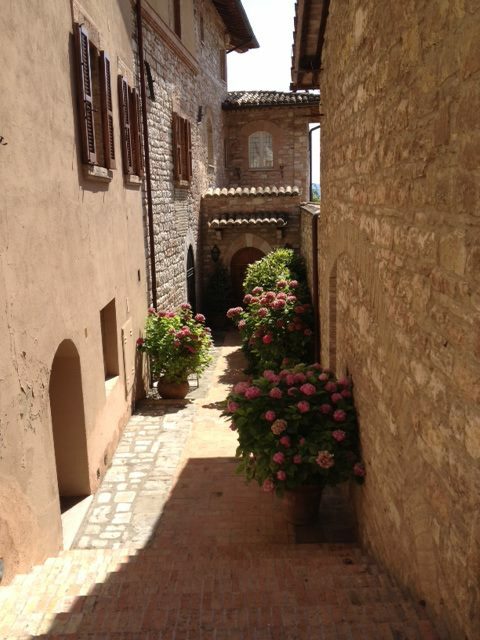 The Country House Tre Esse is just a 20-minute walk from the Basilica of San Francesco and Assisi centre. 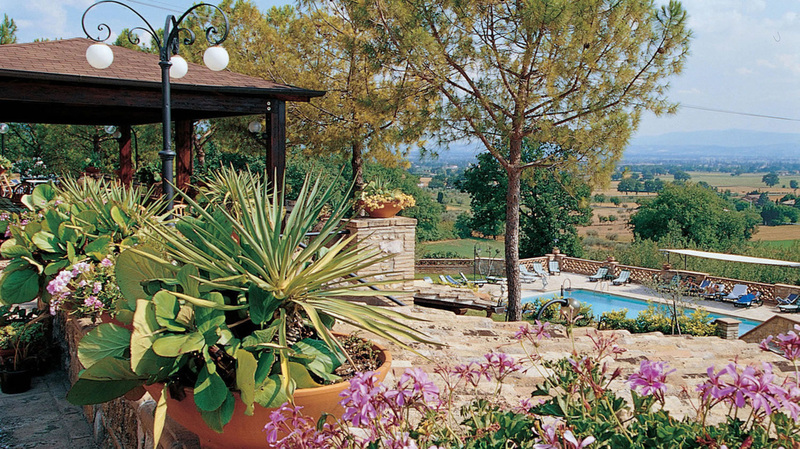 The hotel has a pretty garden, swimming pool and a a sun terrace overlooking the beautiful plain of Santa Maria degli Angeli, which is a wonderful place to relax with a drink during the summer evenings. 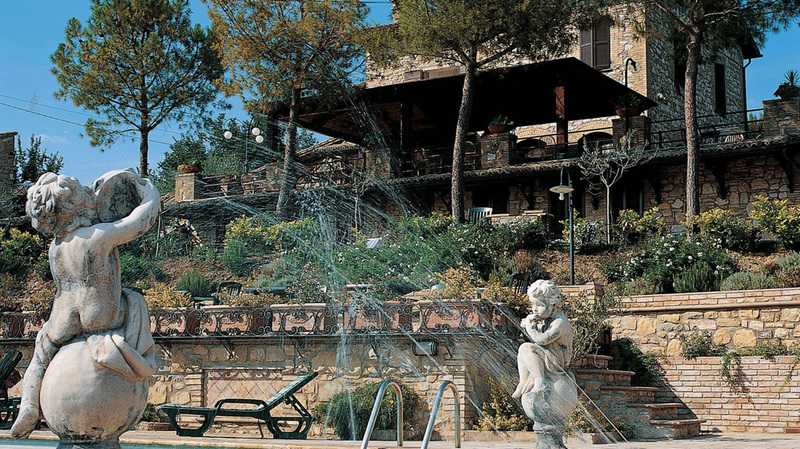 Rooms are located in the main hotel and in two separate buildings in the garden and have TV and private bathroom. They are set in a historic stone building, traditionally decorated with antique furnishings. Breakfasts - Continental breakfasts are provided daily for guests staying at the Country House. This typically includes breads, cheese, meats, fruit, juice, cereal and coffee. Lunches - Delicious, traditional Italian lunches will be provided on Tuesday, Wednesday, Thursday, Sunday and Monday. These lunches are a truly authentic Italian meal with fresh vegetables, cheeses, and pastas. Dinners - There are four dinners included with the conference fee. Tuesday and Wednesday dinners will be at The Country House. Friday’s dinner will be at a great local pizzeria: La Bella Vista and then the final gala celebration dinner on Monday evening at the castle, Il Maniero complete with a seven course authentic Italian meal and live music and dancing. • By telephone: Call us at 860-415-5004, and we will be happy to help you register, provide more information, and/or help with your travel plans. Open to the general public as well as mental health professionals. No prerequisites are required. Arrangements can be made for family or friends interested in accompanying participants (but not attending) the lecture presentations. We strongly recommend travel insurance for losses necessitated by having to cancel your participation. We are in the process of applying for Continuing Education credit with the Commonwealth Educational Seminars (CES).